I’m bursting with excitement, as my daughter and I are returning to NYC tomorrow for a week of fun and garden-touring. For those of you who don’t know, we lived there for two months in 2014 and had such an amazing life-enriching time that I couldn’t wait to return, even if only for a few days. Earlier this week I was reading my previous articles about the gardens we visited when I realized I never wrote about my trip to Wave Hill! I had every intention to, as it’s an incredible garden, but my life was sort of thrown into a chaotic whirlwind when I returned (to say the least), and the article must’ve fallen by the wayside. Well, better late than never, right? Here are a few of my favorite parts of this incredible garden. This turn of the century 28-acre estate sits high above the Hudson River, located about an hour outside of Manhattan, in the Bronx. Getting here is a bit of a haul, but oh-so worth it. When entering the grounds, visitors are drawn to the Pergola Overlook (above) like moths to a flame. Strategically built to frame the breathtaking views of the Hudson River and the the soaring Palisades. I was no different, and must have sat here for 20 minutes, taking in the view, before finally turning around to see yet another jaw-dropping scene – the Flower Garden. This part of the garden, while formal in design, is informally planted with a jumble of colorful, lush, and blowsy plants. But even though there are so many plants in this relatively small space, harmony reigns supreme thanks to the use of color echoes. The echoes of warm yellows and golds repeated on either side of the pathways, and the deep burgundy tones of the daylilies and amaranth that help tie together a bed planted with so many varieties of plants. The result is my favorite style of all – a blend of formal and informal with a hefty dose of controlled chaos. But, as I’ve written about before, a garden with nothing but one repeating echo after another can quickly become a tad predictable – which is where contrast comes in to save the day. For example, even though the plants below contain echoes of soft blues and purples, the contrasting shapes help prevent them from blurring into one another. Just take a look at the spiky balls of Sea Holly planted near the weeping form of the False Hemp. Or the two very different shapes of the clematis durandii and the clematis trinernata ‘Rubromarginata’. And even the Pale Purple Coneflower (echinacea pallida) planted near the fading blooms of the ‘Invincible’ hydrangea. Scattered throughout the garden are the iconic Wave Hill chairs, providing a welcome place to rest and absorb the surrounding beauty. The chairs are based on one designed by acclaimed Dutch architect Gerrit Rietveld in 1918. For those of you who love this chair as much as I do, here’s a site where you can purchase one or, if you’re particularly handy, build your own if you’re so inclined. In another part of the garden is the stone foundation of an old greenhouse from decades past. Warmly nestled among the walls and stones is the Herb Garden, filled with edibles from the warmer regions of the world. I was surprised to see so many succulents happily growing in the cracks and crevices of the stones. After wandering through the warm and dry Herb Garden, we found ourselves in the cool and shady Aquatic Garden. The formal garden pool is host to tropical and hardy water plants, fish, frogs and loads of dragonflies. 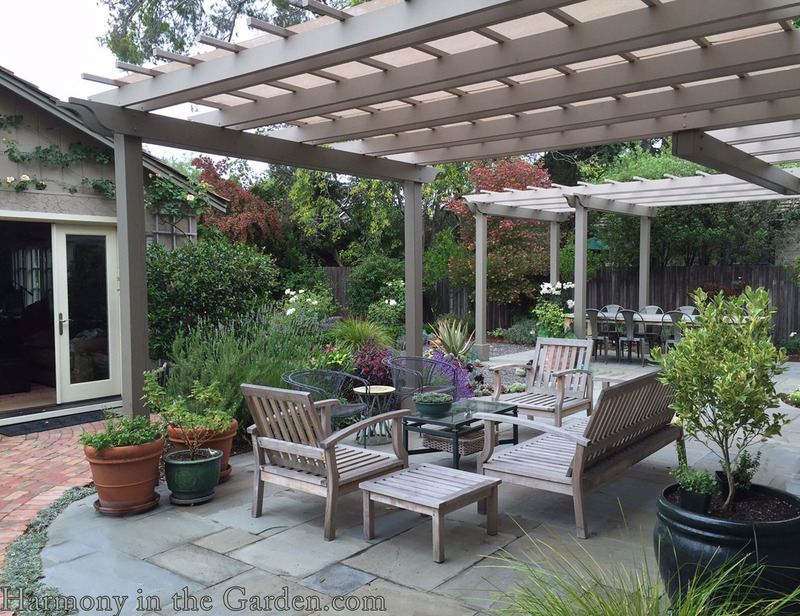 A vine-covered pergola provides much-needed shade during the hot summer months. I particularly liked the curtain of the giant Weeping Blue Atlas Cedar that softly drapes over the arbor. While exiting the garden, I noticed this fire hydrant tucked along a garden wall. Hey, if you can’t eliminate an eyesore at least make it pretty, right? I’m planning on visiting this garden again so stay tuned for an update! I love controlled chaos. That is indeed a beautiful garden and a lovely blend of formal elements and soft, flowing, informal plants. It’s my dream to go! For now, once again, I get to view it through your very perspective eyes! Thank you, Linda! I hope you’re able to go someday – it’s a very special place. You have me looking forward to seeing Wave Hill, your photos and descriptions are heavenly. I always look forward to your emails thank you Rebecca, wishing you a wonderful time! I always look forward to seeing an email from you. I must put Wave Hill on my list of gardens to visit someday. I wish you a wonderful time in New York with your daughter and I look forward to more descriptions and photos from your time there. It is always an enjoyable break to read and view your posts, thank you Rebecca. Thank YOU, Vivian, what a nice comment to read! We’re boarding the plane in just a bit and I can’t wait. The gardens there are so different than the ones in hot and dry California, and are such a joy to visit. I love Wave Hill – one of my favorite public gardens! You and me both, Laura! open to public, after being closed off since early 20th century. Oh wow, really? I hadn’t heard about that and will see if I can find something on Google. If you know the area, please let me know as I’d love to see it! You’re welcome, Mette – thank you! I love being walked through this garden through your eyes, Rebecca. It’s quite the beauty. Have the best week with your girl, I know you will!